In The Joy of Gluten-Free, Sugar-Free Baking by Peter Reinhart and Denene Wallace, I have found many recipes to try that fit the way we eat now. First I had to track down new kinds of flour. 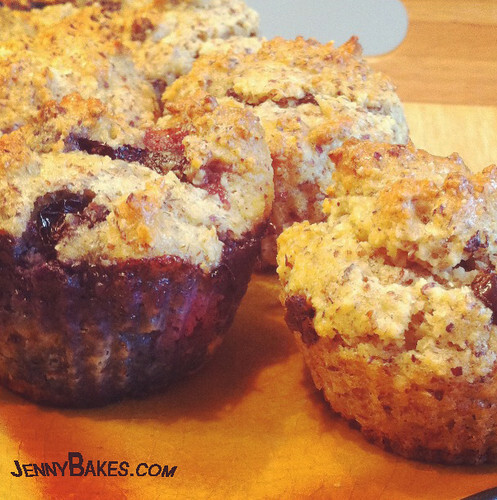 After snagging hazelnut flour, I used almost the entire bag to make these muffins. The original recipe is for a hazelnut-coconut coffee cake. I couldn't decide between adding blueberries or chocolate chips, so I decided to just make muffins instead. Half of the dough got chocolate chips stirred in, and the other half got blueberries. The blueberries added a wee bit too much moisture, I neglected to realize that without traditional flour to soak up the moisture, the blueberry muffins were a bit wet. I made a few other changes to the recipe - I used almond-coconut milk instead of straight coconut milk, and left out the toasted coconut. I can see how those flavors would have been really nice, I just didn't have any on hand. Instead I added vanilla extract. I also didn't use as much Splenda as was called for; I always intentionally cut back on it to limit the chemical taste overpowering the recipe. From what I've read of others' opinions, I get the impression that taste doesn't bother everyone the way it bothers me. So I just minimize. These were lighter than the flaxseed muffin disaster I had last year, although you can still tell they are not traditional flour. The flavor of hazelnut flour is nice and not overpowering. I also had to buy xantham gum again, but I couldn't tell you how much it did to the texture. Low-carb, low-sugar people: buy this book. I haven't found any cookbook with recipes that are more palatable. The next recipe I want to try is one of the sandwich bread recipes. We need bread that fits in with the way we eat!! I may have enough hazelnut flour left to do one of the flaxseed-heavy recipes, so I may do that this afternoon. Also, the carrot cake on the cover certainly looks tasty!